Andrew Lubash, campus and community activist, is among 59 scholars named nationwide. 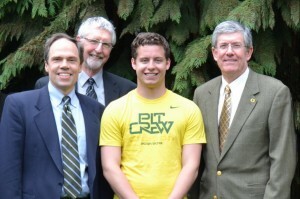 Oregon junior Andrew Lubash of Beaverton received the prestigious 2014 Truman Scholarship. Former Secretary of State and Truman Foundation President Madeleine K. Albright announced the 59 winners at 5 pm today in Washington, DC. Lubash attends the UO Honors College, double-majoring in Economics and Political Science. As a leader both on campus and in the community, Lubash displayed the most sought-after qualities of a Truman Scholar, which include academic achievement, demonstrated community service and leadership, and a desire to pursue a career in public service. Bruce Blonigen, Acting Associate Dean of Social Sciences and a faculty rep for the 2014 Truman Scholarship, was impressed early on with the strength of Lubash’s application, which includes involvement in ASUO student government, Oregon Student Association, and an internship with Senator Mark Hass. “I’m usually not good at predicting things like this, but as soon as I saw his list of accomplishments, I knew he’d be chosen,” Blonigen says. The aim of the Truman scholarship, according to Former Secretary Albright, is to “serve as a gateway for America’s public service leaders.” Truman Scholars receive up to $30,000 for graduate studies, in addition to priority admission and supplemental aid for some of the premiere graduate institutions. Scholars also take part in leadership training, and receive additional opportunities for special internships within the federal government. Lubash joins 59 new Truman Scholars, mostly college juniors. 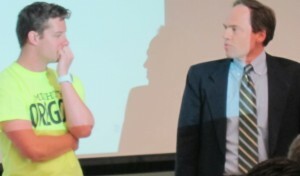 He will be only the eighth student from the University of Oregon to receive the honor. This year’s recipients were selected from among 655 candidates nominated by 293 colleges and universities. Past Truman Scholars include such notables as Janet Napolitano, Bill de Blasio, George Stephanopoulos, Susan Rice, and Jon Favreau. Read more about Lubash’s story at Around the O.